Director – Roland Emmerich, Screenplay – Roland Emmerich & Harald Kloser, Producers – Roland Emmerich, Mark Gordon & Michael Wimer, Photography – Ueli Steiger, Music – Harald Kloser, Additional Music – Thomas Schobel & Marcus Trumpp, Visual Effects Supervisor – Karen E. Goulekas, Visual Effects – Double Negative (Supervisor – Jesper Kjolsrud), Machine & The Moving Picture Company (Supervisor – Nicolas Aithadi), Special Effects Supervisor – Dominic Tuohy, Miniatures Supervisor – Joachim Grueninger, Miniatures – Magicon GmbH, Creature Effects – Tatopolous Designs, Production Design – Jean-Vincent Puzos. Production Company – Centropolis Entertainment/Legendary Pictures. Amid the primitive Yagal tribe, D’Leh grows up loving the blue-eyed Evolet. However, he is regarded with dishonour because his father left the tribe. D’Leh sees his opportunity to gain standing with the tribe and claim Evolet as his by competing for the White Spear in a mammoth hunt. He wins, although feels that he did so unfairly because the mammoth merely fell on his spear. The tribe is then raided by horsemen and Evolet and a number of others captured. D’Leh leads a small group in pursuit. The journey takes them to faraway lands and encounters with different peoples and creatures, finally to where Evolet and the others are being used as slaves to build The Pyyramids. There D’Leh realises that he has been prophesied to lead the captured tribes to overthrow the slavers. The prehistoric drama is one of the creakiest genres in science-fiction. The genre began some time during the silent era, although the work that solidified it was One Million B.C. (1940), which started the cliche of cavemen battling against stop-motion animated dinosaurs. This was copied by a number of films. The most famous was Hammer’s remake One Million Years B.C. (1966) with Raquel Welch and their various follow-ups Slave Girls/Prehistoric Women (1967), When Dinosaurs Ruled the Earth (1970) and Creatures the World Forgot (1971). The prehistoric drama always held limited dramatic potential due to the fact that dialogue either had to be relayed in grunts, sign language or the decidedly noticeable improbability (as in 10,000 BC) of cavemen talking in perfect English. The fun in these films was always the battles between cavemen and stop-motion animated dinosaurs, even if this meant an anthropological anachronism of around 64 million years so that the two species could co-exist. During the 1980s, the caveman drama began to be revised with works like Quest for Fire (1981), Iceman (1984) and Clan of the Cave Bear (1986), which attempted to inject a greater degree of anthropological realism into the genre. Other efforts such as Caveman (1981) and tv’s Dinosaurs (1991-3) spoofed the genre. In recent years, the prehistoric drama has been taken over by animated children’s films with the likes of The Land Before Time (1988), Dinosaur (2000) and Ice Age (2002). 10,000 BC comes from German director Roland Emmerich. Emmerich emerged in West Germany in the mid 1980s with films such as The Noah’s Ark Principle (1984), Making Contact/Joey (1986), Ghost Chase (1987) and Moon 44 (1990). Emmerich debuted in the US mainstream with Universal Soldier (1992) and then went onto lavish big-budget successes like Stargate (1994), Independence Day (1996), Godzilla (1998), The Patriot (2000), The Day After Tomorrow (2004) and, subsequent to this, 2012 (2009), Anonymous (2011), White House Down (2013), Stonewall (2015) and Independence Day: Resurgence (2016). Roland Emmerich’s forte has always been big budget special effects. Beneath the lavish arrays of CGI effects and visual spectacle that Emmerich arrays however, his films are only warmed over retreads of tried and true science-fiction themes – the alien invasion film, the global catastrophe film, the Japanese monster movie and here the prehistoric drama. As a director, Roland Emmerich lacks the ability to depict characters that have more than a single dimension or direct drama in anything other than simplistic cues. 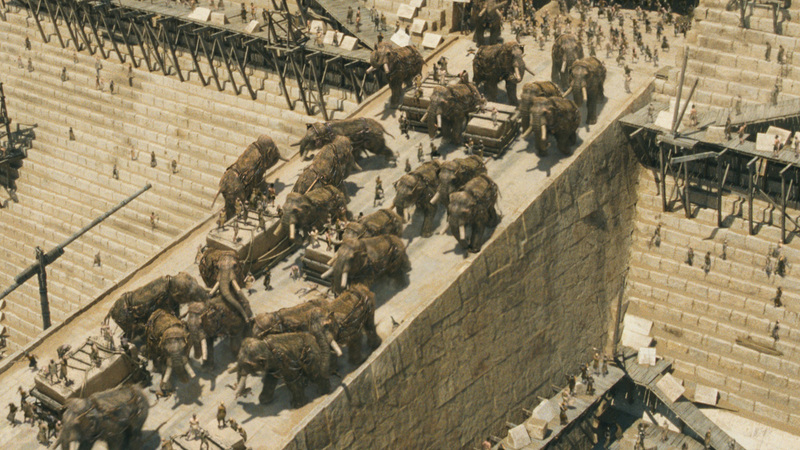 10,000 BC has been construed almost entirely as a spectacle film on Emmerich’s part. 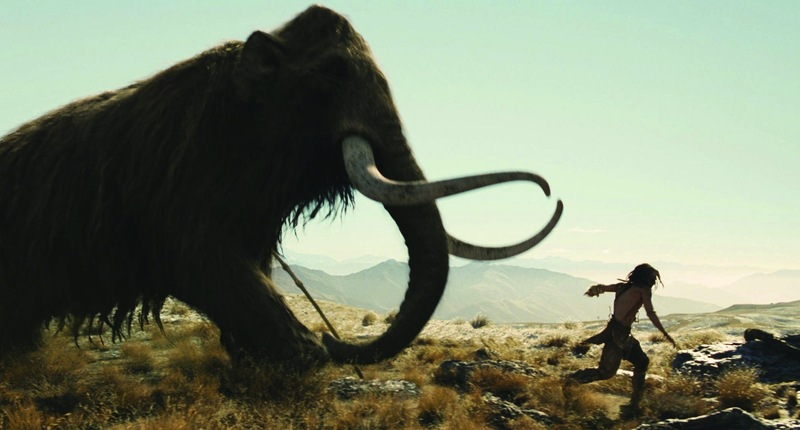 Certainly, the mammoth hunt we have in the first few minutes holds a degree of exciting drama and conviction in its effects. However, the film’s credibility takes a considerable nosedive when Emmerich has Steven Strait being pursued through tropical jungle by what look for all the world like giant ostriches. One guesses that Emmerich was trying to introduce a horde of prehistoric moas (which one seems to remember were herbivorous rather than the carnivorous creatures they are depicted as here), however the effect when the creatures are first unveiled contrarily causes the audience to laugh. Emmerich is more successful with subsequent sequences such as the appearance of a sabre-tooth tiger. Especially good is when we arrive at the pyramids and Emmerich’s camera cruises around showing mammoths and hundreds of slaves carting blocks of stone up the ramps or during the climactic scenes where the slaves revolt. The landscapes – variously shot in Namibia, New Zealand South Africa – are visually arresting. To 10,000 BC‘s credit, Roland Emmerich at least has sufficient credibility not to give us cavemen fighting dinosaurs. However, in trying to watch 10,000 BC outside of the spectacle arrayed and on almost any level that requires one’s brain to engage, you cannot help but laugh at the silliness of it. I kept wondering where the film was meant to be taking place. There is no mention of travel distances up until we arrive at The Pyramids and so one has no idea whether the journey was taking hours, days or many months. Even so, it is hard to work out how snowy mountainous areas can sit abruptly alongside tropical jungle and desert (which given that The Pyramids are being built presumably makes the film’s setting as somewhere around the Nile Delta). To locate these disparate regions within Africa, you would have to be talking about some thousands of miles of foot travel distance. There is also the film’s dubious given date of 10,000 B.C. The sabre-tooths, mammoths and moas are accurate for the date but there is a massive anachronism in also throwing in the pyramid building era of Ancient Egypt. Around 10,000 B.C., Egypt was barely into Neolithic culture – the use of stone tools, pottery making and the beginnings of the move from hunter-gatherer cultures to agrarian societies. The great age of pyramid building did not come along for a further 7000 years. One of the silliest parts of the film is when Roland Emmerich starts to indulge in the same loopy Erich Von Daniken theories that he did in Stargate, speculating that the gods of the pyramids flew there from somewhere else or arrived from the stars. In Stargate, Emmerich’s use of Von Daniken was at least entertaining but here one starts to get the impression that he takes this nonsense seriously. (In the same vein, he and co-writer Harald Kloser went onto make 2012 (2009) based on the nonsensical mystical ideas of New Age writer Jose Arguelles and his Harmonic Convergence movement, which claim that the Mayan calendar prophesies that the world is supposed undergo a radical shift in consciousness on that date). There is also a good deal of silly nonsense in the script about prophecy and predestination. This is standard stuff from heroic fantasy, although one wonders why it is employed in a supposedly realist anthropological drama. For all Roland Emmerich’s willingness to employ state of the art technology in creating his vision of the past, he contradictorily embraces a New Age mysticism – the view that the primitives’ view of the world was more intuitive and in touch than modern perceptions. The silliest aspect of this is the groan-inducing ending where Camilla Belle is killed by a thrown spear, only for the Old Mother who has been using her magic powers to watch at remote distance to elect to die and use her lifeforce to revive Camilla. It is an extraordinarily silly plot device – least of all for a character that Emmerich has established in so little depth to make her death seem tragic. The story is slight. There are annoying loose ends – a big thing is made about how D’Leh’s father left (but did not abandon) the tribe and we keep getting references to this throughout, but, despite such foreshadowing, the father proves to be of no subsequent relevance to the story. Ironically, for all the film’s use of an heroic storyline, few of the people on-screen emerge from out of the fur and dreadlocks to become animated characters – the sole exception might be Cliff Curtis. Certainly, the romance that Steven Strait is supposedly travelling to the ends of the earth for is non-existent. 10,000 BC was parodied in Disaster Movie (2008).